One of the easiest ways to save a bundle of money on home repairs, maintenance and renovations is to do the work yourself. You could say we’re a nation of do it yourselfers. With more homeowners taking on projects, it’s no surprise home improvement expenditures in the U.S. are expected to go from $326.1 billion in 2015 to $406.8 billion by 2019. There are countless projects that are perfectly suited for DIYers, but there are just as many that should only be handled by a professional. 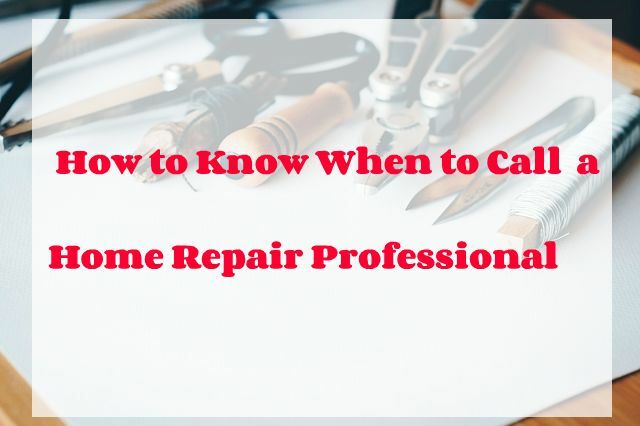 But how do you know if you can handle a home repair yourself and when a professional needs to be called? Start by asking yourself a few simple questions. Do you have the experience, licensing, certification etc. needed for the job? Safety is the top concern when a homeowner takes on a project. Your chances of getting hurt significantly increase if you get in over your head. That’s why some professions require special licensing or certification to prove that the individual has had the training to safely perform a task. Electrical work is an instance when you need to call in a professional. Faulty electrical systems and equipment are some of the most common causes of house fires. Saving a few bucks doing an electrical project yourself isn’t worth potentially causing a house fire that destroys your home. Special training or licensing may also be needed in order to handle the materials for the project. For example, some types of HVAC repairs need to be done by a licensed technician since they are authorized to handle refrigerant. They are also trained to troubleshoot HVAC systems to accurately determine the problem. For untrained homeowners, this troubleshooting process could lead down the wrong path and increase the cost of the fix. There’s one more factor to consider – permitting. If a project requires a permit to be completed you’re better off using a professional who knows what’s needed to meet code. Do you have the tools needed for the job? Don’t have all the tools you need to get a project done? Consider if you have the tools to do at least part of the job to save money. Most homeowners have the tools needed to do the demo work before retiling a shower, but they may not have a wet saw to cut the tiles for installation. Renting tools or joining a neighborhood sharing group can help you get the equipment you need without blowing your repair budget before the work is done. However, if you aren’t comfortable or don’t know how to use a tool, it’s safest to let someone with experience handle the job. Do you have the time to get the job done? Time is also a big factor that could have an impact on the overall cost and safety of a home project. Take a window install, for example. The project will temporarily leave a gaping hole in the side of your house. The longer it takes to get the new window in place the more at risk you are for a break-in or insect infestation. Your time with your family is valuable. If a project is going to take a lot of time to complete on your own it may not be worth sacrificing your social life. The project could also disrupt your home life, making everyone’s lives miserable until it’s completed. Doing things yourself around the house provides a sense of accomplishment and helps you create a stronger connection with your home. However, you could do more harm than good if you aren’t properly equipped to do the work. When in doubt, call a professional and be their assistant for the day so you can pick up a few tips for your next DIY project. Previous articleIs Laminate Flooring Worth It?